If you are an adult in the Houston, Texas area exploring possible psychological counseling for a relationship issue from an experienced specialist, then we would likely be a good fit for each other, and I would love to work with you. My interests, knowledge, training, and experience have focused predominately on marriage and couples counseling, affairs counseling, premarital counseling, and dating counseling. I have been a licensed psychologist specializing in marriage counseling and other adult relationship counseling here in Houston, Texas since 1987. More than 90% of my clients have had such relationship issues throughout my full-time career as a private counseling psychologist. I have enjoyed working collaboratively with thousands of individuals and couples in fulfilling their personal, dating, marriage, and other adult psychological goals here in Houston. To learn more about my approach to marriage counseling, affairs counseling, dating counseling, premarital counseling, or couples counseling, please refer to the menu of "Articles For Consideration." Now I also enjoy training other professionals to conduct marriage and couples counseling. Serving as a psychological expert for much of the Houston, Texas television, radio, and press has been an honor for me. I also have enjoyed leading hundreds of seminars for the Houston public on dating, premarital, marriage, and other psychological issues as well as leading seminars for professionals on marriage and couples counseling. I served for seven years on the executive committee of the Houston Psychological Association, which honored me with a President's Award. I am a member of the Texas Psychological Association, for which I have given professional training seminars on marriage and couples counseling. I am a member of the American Psychological Association, which kindly wrote a feature article on me. Click here to view it. I am also a member of the Harris County and Texas State Mental Health Associations. In addition to leading seminars to train other professionals in marriage counseling, I have benefited by receiving extensive professional training from most of the leading marriage counseling experts in the country, including but not limited to John Gottman, Susan Johnson, John Gray, Harville Hendrix, Virginia Satyr, Ellyn Bader and Peter Pearson, Gary Brainard, Frank Pittman, Shirley Glass, Janice Abrahms Spring, and Neil Jacobson. In conducting counseling, I am fortunate to be able to choose from numerous resources including principles from Gottman's research, Emotionally Focused Therapy, Mars & Venus Counseling, Imago Therapy, Positive Therapy, Interpersonal Therapy, Systems Therapy, Cognitive-Behavioral Therapy, Psychodynamic Therapy, Rogerian Therapy, Integrative Therapy, Humanistic Therapy, Transactional Analysis, Reality Therapy, Rational Emotive Therapy, Gestalt Techniques, NLP, and EMDR. I also offer counseling tools that I personally developed here in Houston. Rather than limit counseling to only one approach, I offer my clients what I think is best specifically for them from all of these experts and approaches and more in doing my marriage and other counseling. I earned bachelor's degrees in both psychology and physics from Southern Methodist University, followed by my doctoral degree in psychology from the highly ranked clinical program at the University of Houston. I taught eleven semesters of a Human Sexuality, Marriage, and Family Living course there. I am a continually active learner who seeks knowledge from working with my clients as well as from professional and personal sources to best help me and my clients fulfill our goals. I especially want to thank my wife Laurie, our daughters Cheryl and Valerie, my parents, and my siblings for kindly and gently helping me to learn from my own numerous relationship mistakes. 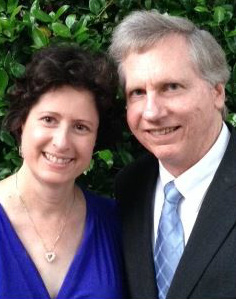 I grew up in the Houston, Texas area where I have lived with my one-and-only, loving wife Laurie since 1987. Laurie has her master's degree in education from the University of Houston and now kindly serves as the executive office manager for our psychology clinic. We have two accomplished daughters: Cheryl in graduate school at the University of South Florida and Valerie in college at Trinity University in San Antonio. Laurie, Cheryl, and Valerie have all contributed extensively to this website and have both my admiration and appreciation. Click on the icons below for other webpages on Chuck Gray, Ph.D.